How do you get better at things? How do you improve yourself without going to college? Yes — you can do it. You have talent! You are running a business, or maybe you are about to start a business, or you are thinking about it, but you have a talent, everyone has a talent. For example, have you got children? How old are your children? If they are 5 or 6, then you have a talent for bringing up children well and successfully. You have fed them, clothed them and are raising them. Who taught you to do that? Anyone? No one? Parents? I’m going to say, I doubt it. I imagine that you just did that on your own without even thinking about it. You managed to cook possibly, you drive a car — there’s lots of things that you can do and those are talents. At work you’ve built a business, or you’re going to build a business, or you might be an artist, a mechanic, or you might even be fantastic at doing landscape gardening. Most people are not good at other things and so this is where we, generally small business owners and entrepreneurs, do it wrong. But no, the reason you’re not good at the other thing is because you don’t like doing it, you don’t want to do it, you’re not very good at doing it, and here’s why — you can’t be brilliant at everything. Where we go wrong is we should be concentrating on the thing we are already good at and making ourselves better, absolute genius, at. Imagine expert level. So you’re already good, become an expert. That’s all, get other people to do the other things. Do you think Richard Branson flying one of his own planes? Have you ever seen him driving a train? Has he ever served you in a Virgin mobile cell phone shop or mobile phone shop? No. He does what he’s good at, and he has other people do what he’s not good at and he genuinely finds people who are better. 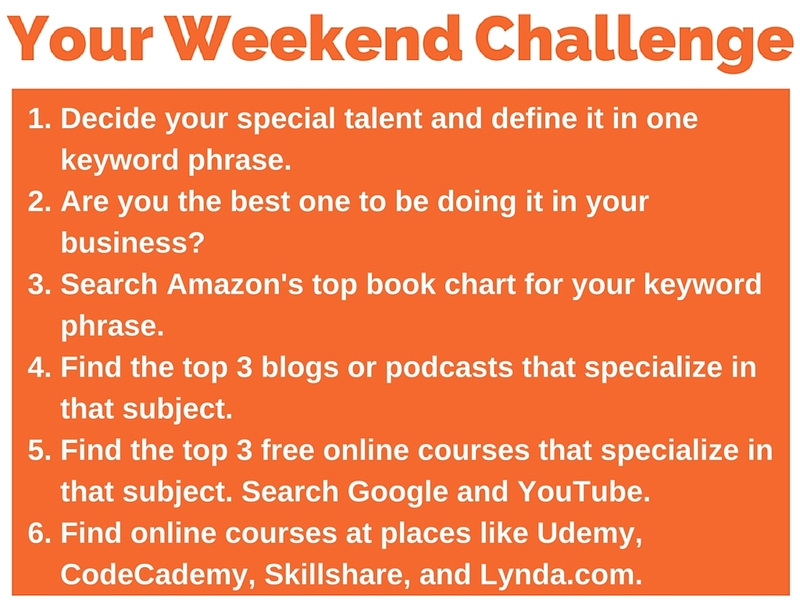 So, here is your weekend challenge and this is what you’re going to do. Decide your special talent and define it in one keyword phrase. So for instance, landscape gardening, something like that. Volkswagen car mechanic, something like that. Marketing. It could be absolutely anything, Direct mail, Customer service, if you’re talking in relation to business, really by the way, you can do this for personal or anything. So that’s it, choose your one. 2. Are You the Best One For this Job? Second, now this is quite important, are you the best one to be doing it in your business or in your life? 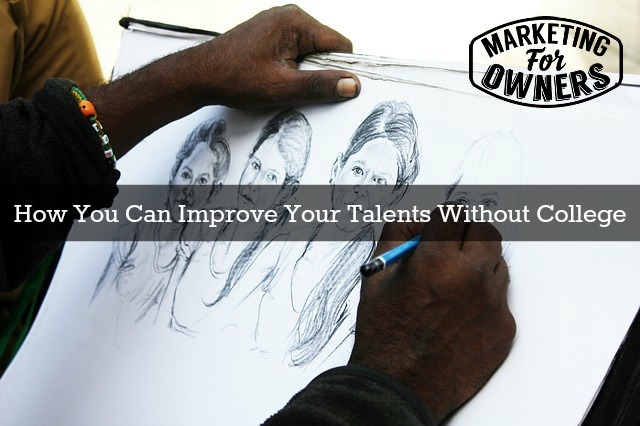 So you might actually think you’ve got a talent, is there someone in your business who is better than you? Come on, be honest. Or are you good enough, could you, should you get to be the right level or should you be outsourcing it? Say for instance, say you’re doing the books for your company; do you still need an accountant to finish off? Are you then going to train and become a full accountant? Rather, so that’s what I mean, certain talents, certain things you’re good at that you really shouldn’t be trying to get better at because that’s an entirely different profession or vocation. Search Amazon’s top book charts for your keywords. So say we are going to learn direct mail because that’s a good thing to know, by the way. So, when you look at a book in Amazon, a business book or something, when you go down, scroll down, there’s the list, it says this is like number 1323 in marketing books, or something like that. Click on the title marketing books and it will go to the chart and it will show you the top 10. Just find the top three that are related to your keyword because they are written by experts and they are very very very popular by the fact that everyone bought them. If you can’t afford the physical version, buy them on Kindle. Find the top three blogs, or podcasts, on the subject, the ones that specialize in that subject, So if it’s direct mail, just Google “direct mail, blogs”, “direct mail bloggers”, Or “bloggers” and then in quotations, “direct mail”. Do search it, you will find, it doesn’t have to be like the top three, there’s not going to be some list that says oh these are the Top three, but ones that consistently, up. Look at their sites and think “wow, fantastic.” So if you’re looking up content marketing, you would go to people like Jay Baer and Vincent Conver or Joe Puluzzi at Content Marketing Institute; experts have everything you need to know. As an example, if you wanted to get better at social media, you would go to Social Media Examiner and other people like Kim Garst or Rebekah Radice, you know that kind of thing. Find the top bloggers and then add them to your feedly and read those blogs consistently, get their stuff, follow them, subscribe to their RSS feed, there will be a way, once you get there you will find out how and it will get sent to you. The reason I say three is you can do five, I don’t want you overwhelmed, three will do, one will do for now, one at a time. Go to Google and search for “direct mail”, “a free course direct mail”, “direct mail, free course”, “direct mail free courses”, get it? “Free training, direct mail”, something like that. Search in Google, but then go to YouTube and the search again, you will find tons and tons of videos on how to do stuff on whole series of videos on how to do stuff in these places like YouTube, it’s free. Find online courses at places like Udemy, CodeCademy, SkillShare and Lynda. Now those services are going to be paid but they are very, very low priced and they’re going to teach you much better skills because they are taught by people who do this stuff, honestly, and you can learn in your time at your leisure As fast or as slow as you want. You can improve your talents, you can get better, you can become that expert that people crave your knowledge. People will be coming to you when they are doing this weekend challenge, because they have gone to marketingforowners.com/challenge and they’ve seen all of the weekend challenges that ever come up and as they work through them when they get this one and they look up direct mail, you’re going to be one of the experts. 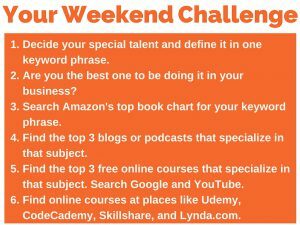 That is your weekend challenge! Get to it and I will see you on Monday.